The Arizona OHV Decal will only be issued by the Arizona Department of Transportation, Motor Vehicle Division. The OHV Decal is available online at www.servicearizona.com, or at any MVD office or authorized MVD third-party service provider. Always purchase your OHV Decal first in renewal transactions with MVD. The OHV Decal WILL NOT be issued at Arizona Game and Fish Department offices. The OHV Decal needs to be obtained through MVD, MVD third-party service providers or online at www.servicearizona.com. It is still your responsibility to make sure your vehicle is up-to-date, as OHV Decals are only good for one year from date of purchase. Why is the new law needed? How can I help keep OHV areas open? Do out-of-state riders need to obtain the Arizona OHV Decal? Title, License Plate, OHV Decal and Registration: What steps do I need to take to be in compliance with the law? What does the ‘RV’ license plate on my OHV mean? I lost my license plate and/or my OHV Decal, now what do I do? What equipment is required to operate my OHV in Arizona? Where can I ride OHVs? What is State Trust Land? Do I need a permit to operate my OHV on State Trust Land? What rules should I follow on State Trust Land? What are the rules and laws concerning OHVs? Are there laws about alcohol and drugs for OHV driving? Do I need to be registered or licensed to drive my OHV? What are the new operating regulations? Are there any OHV Decal exceptions -or- I’m from out-of-state do I need to obtain the OHV Decal? OHV use in Arizona has exploded (347 percent increase since 1998), outpacing the existing funding to manage that growth, protect wildlife habitat, and help maintain recreational access. Revenues generated from the new OHV Decal user fee will be used to help ensure sustainable opportunities and natural resource protection by bolstering funding and grant programs that pay for trail maintenance, signage, maps, facility development, habitat damage mitigation, education and enforcement. It specifies OHV Decal, title, license plate and registration requirements. It specifies regulations for safe, ethical and responsible operation. Get involved. Educate yourself by stopping in and talking with land managers at their office. Or, if you see them in the field, stop and ask questions. – Respect others. Be especially cautious around horses and hikers. Pull off to the side of the trail, shut off your engine, and let the horses or hikers pass. – Keep your OHV quiet. Loud OHVs have no place in the backcountry. – Stay on trails and in areas open to OHV use. The OHV Decal is a sticker that must be purchased annually for $25 to allow your OHV to be operated within Arizona. The decal will need to be applied to the upper left corner of your license plate, and your license plate will need to be visibly displayed on the rear of your OHV. The dollars collected through the purchase of the OHV Decal are considered an OHV user fee and apply to all OHVs meeting the bulleted criteria in the following paragraph. The OHV Decal should not be confused with “registration.” Registration is required if you want your OHV to be “street legal” (i.e., operate it on paved and improved roads and streets) and you’ll still need to obtain the OHV Decal if you meet the two requirements. An off-highway vehicle is any motor vehicle operated on unimproved roads, trails and approved use areas not suitable for conventional two-wheel-drive vehicular travel. Examples include: ATVs, ROVs, trail motorcycles and dirt bikes. Designed by the manufacturer primarily for travel over unimproved terrain. Pickup trucks, SUVs, cars and other recreational vehicles are not required (and will not be able) to obtain an OHV decal. All other vehicle regulations apply. The cost of the OHV Decal is $25 and is available online at www.servicearizona.com (it’s in the All Services section at the bottom of that page) or at any Motor Vehicle Division (MVD) Office or authorized third-party service provider. The decal is valid for one year, and it is the ATV/OHV owner’s responsibility to renew their OHV Decal annually. A renewal notice will now be sent from Game and Fish, but you still get the OHV Decal through MVD. Always purchase your OHV Decal first when in a renewal transaction with MVD. Your OHV/ATV must have an Arizona Certificate of Title in your name. If the vehicle is not titled in your name or you have an out-of-state title, you will need to visit an MVD Office or authorized third-party provider to obtain an Arizona Certificate of Title. All ATV/OHV owners must obtain an Arizona Title for their vehicle(s) by July 1, 2009. If you need to confirm the vehicle has been issued a license plate and title, you may request a Motor Vehicle Record (MVR) online at www.servicearizona.com or visit an MVD Office or authorized third-party service provider. The vehicle identification number (VIN), your driver’s license number and a $3.00 fee is required to obtain an MVR. You can obtain the annual $25 OHV Decal for your OHV online at www.servicearizona.com or at an MVD Office or authorized third-party service provider. The OHV Decal shall be affixed to the upper left corner of the license plate, like you see here. The placement of the OHV Decal is exactly the same for qualified registered or “street legal” vehicles. The OHV Decal is valid for one year from purchase. As of April 1, 2011, you will be sent a renewal notice from the Game and Fish Department, but the OHV Decal is only sold at MVD offices or online at www.servicearizona.com. (It’s in the All Services section toward the bottom of that page.) It is still your responsibility to renew and display a current OHV Decal on your vehicle license plate annually. If you want to ride on improved and maintained roads (streets, highways or Forest Service roads) your OHV can be registered for “street legal” use in Arizona. Your vehicle will first need to be titled and needs to meet all on-highway equipment requirements. If you meet the OHV Decal requirements then you will also need to purchase the OHV Decal. The Arizona Game and Fish Department does not Title or Register OHVs. For more information about Titling or Registering your OHV go to MVD or online at www.azdot.gov/mvd. 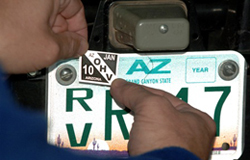 The “RV” plate on your OHV is only an indication that the OHV has been titled in the State of Arizona. It is NOT a registration plate and does not allow you to ride on roads that require your vehicle to be registered. To ride on paved or maintained roads you need the “MC” or Motorcycle registration plate. I have a Title plate and OHV Decal – Where can I ride? The title-only license plate allows for travel on roads and trails that do not require “street legal” registration. An ATV or OHV operating on a dirt road that is located in an unincorporated area of this state. For this purpose, “dirt road” means an unpaved or ungraveled road that is not maintained by the state, county, city or town. A person operating an OHV who is participating in an OHV special event. An ATV or OHV that is only incidentally operated or moved on a highway. A golf cart used in the operation of a golf course or only incidentally operated or moved on a highway. If it is lost, stolen or mutilated, then you may obtain a replacement for a $5.00 fee at an MVD Office or authorized third-party provider. I own a truck, jeep or sandrail that doesn’t meet the OHV Decal requirements and would like to obtain the OHV Decal to help support the program. Can I do that? The ASA4WDC sponsors safety clinics that teach the basics of 4WD. State Trust Land is land that was granted to Arizona by the federal government when Arizona became a state in 1912. Trust lands total approximately 9.4 million acres and are managed by the State Land Department. The land is held in trust by the State of Arizona, and by law, must be used to generate revenue to fund public schools, universities and other state institutions. State Trust Land is not public land. You must have a permit to be on State Trust Land. Yes. You must have a recreational permit or a hunting or fishing license to be on State Land. However, a hunting or fishing license is valid only if you are actively engaged in hunting or fishing. Recreational Permits are available for individuals and families and are issued for one year from the date of purchase. As of Aug. 1, 2008, you may pick up your recreational permit in person at any State Land Department Office or you can order one by mail or by telephone at (602) 364-2753. Most state land is already leased to someone. When recreating on state land, please keep in mind that someone else is trying to make a living from that land. – Camp at least 1/4 mile from any livestock or wildlife water catchments, tanks, etc. Each agency that manages public land has its own rules, regulations and laws to enforce. Rules and laws change. Before using public lands, check with the local land management agency office about rules and requirements. Keep current about changes in OHV regulations. Most areas restrict OHV use to established roads and trails. Some areas have seasonal closures because of wet roads or wildlife breeding or nesting areas. The operation of an off-highway vehicle requires skill and good judgment. Drugs and alcohol impair both. You become a danger to yourself and others when you operate your OHV and take drugs or drink alcohol. Laws regarding DUI apply everywhere in the state. You can be arrested if you are driving under the influence even if you are on a backcountry trail, and the penalties are the same including jail time and the loss of your driver’s license. State motor vehicle laws apply on many Forest Service and BLM roads, meaning your vehicle must be registered and you must be licensed. A good rule of thumb is if a passenger car can use the road, your vehicle will need to be “street legal.” Some roads and trails are open to unlicensed recreational motor vehicles. Check with the local land manager for information on road status. Travel is limited to roads, trails and areas that are designated open by the land management agency for motorized vehicle use. Travel by motorized vehicles that causes damage to wildlife habitat, riparian areas, cultural or natural resources or property or improvements is prohibited. No removal or placement of regulatory signs, other than at the direction of a governmental agency. Are there any OHV Decal exceptions? The person is participating in an off-highway special event. The person is operating an all-terrain vehicle or off-highway vehicle on private land. The person is loading or unloading an all-terrain vehicle or off-highway vehicle from a vehicle. During a period of emergency or if the operation is directed by a peace officer or other public authority. The vehicle is not in Arizona for more than 30 consecutive days.